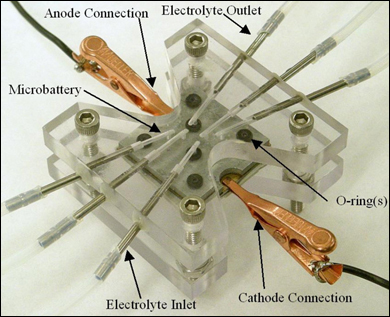 Image of a packaged microbattery showing the fluidic and electrical connections. Gerasopoulos et al., JMM 2008. A paper by Konstantinos Gerasopoulos, Matthew McCarthy, Elizabeth Royston, James N. Culver and Associate Professor Reza Ghodssi (ECE/ISR) has been selected to be part of "Highlights of 2008" by the Journal of Micromechanics and Microengineering (JMM). Gerasopoulos is a Ph.D. student in Materials Science and Engineering at the University of Maryland and McCarthy, now a postdoctoral researcher at MIT, was a postdoc in Ghodssi's MEMS Sensors and Actuators Laboratory. Culver is an associate professor and Royston, now with the US Patent and Trademark Office, was his Ph.D. advisee at the Center for Biosystems Research, University of Maryland Biotechnology Institute. The paper, "Nanostructured nickel electrodes using the Tobacco mosaic virus for microbattery applications," explains how nanostructured nickel–zinc microbatteries can be developed using the Tobacco mosaic virus (TMV). The TMV is a high aspect ratio cylindrical plant virus which has been used to increase the active electrode area in MEMS-fabricated batteries. Genetically modifying the virus to display multiple metal binding sites allows for electroless nickel deposition and self-assembly of these nanostructures onto gold surfaces. This paper presents the integration of this biotemplating approach into standard MEMS micromachining for the development of microfabricated batteries. The TMV-modified devices exhibited a six-fold increase in battery capacities compared to devices with planar electrode geometries. "Highlights" is a selection of articles chosen by the JMM's editorial board and publishing team that best represent the high quality and breadth of the contributions published in the journal in the past year. The special collection is widely promoted by the JMM throughout the year.